WASHINGTON (CNS) — Advocates for refugee admissions into the United States decried what one statement called a historically low cap of 30,000 for fiscal year 2019, which begins Oct. 1, and asked Congress to work with the Trump administration to more than double that number. The 30,000 figure is one-third less than last year’s 45,000, which had been the lowest number on record. Secretary of State Mike Pompeo released the number Sept. 17. A group of advocates, on a Sept. 18 conference call with reporters, said the number had been issued without consulting Congress, which is required by law. That has led to hope that Congress can persuade the administration to increase the number. With just days left in the current fiscal year, the administration has processed only 20,918, less than half of the fiscal 2018 allotment, said Jen Smyers, director of policy and advocacy for Church World Service. “Our hearts are at least big and wide enough to welcome 75,000 people into the country,” said Mary Giovagnol, executive director of Refugee Council USA, on the conference call. Smyers said there is a basis for the larger number. “We have, right now, enough refugees who are approved or far enough in the security check process to be far greater than 75,000,” she said. The low numbers hurt the United States in more than one way, according to Scott Cooper, director of national security outreach for Human Rights First. “It’s been so helpful and strategically for us through many, many years. The people who are fleeing these conflicts are the victims of these conflicts. They are not a threat to us,” said Cooper, who served 20 years in the Marines. 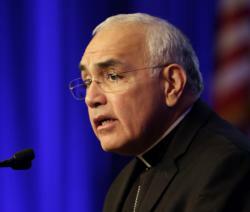 The 30,000 figure is “deeply disturbing and leaves many human lives in danger,” said a Sept. 18 statement by Bishop Joe S. Vasquez of Austin, Texas, and chairman of the of the U.S. bishops’ Committee on Migration. “To cut off protection for many who are fleeing persecution, at a time of unprecedented global humanitarian need, contradicts who we are as a nation. Offering refuge to those fleeing violence, torture, or religious persecution is a cornerstone of our history. We as a country are blessed with vast resources making us capable of securely welcoming those fleeing harm,” Bishop Vasquez said. “Congress should strongly urge the administration to return to a refugee admission level that reflects local community response and support of refugees, global refugee protection needs, and our long history of compassionately welcoming refugees,” he added. Catholic voices in particular blasted the new, lower number in separate statements issued Sept. 17. “By further slashing our refugee quota and shutting our doors to the most vulnerable, the Trump administration is abandoning the United States’ historic moral vision as a beacon of freedom and hope for narrow-minded xenophobia and fear. Americans can do better,” said a statement by Gerry G. Lee, executive director of the Maryknoll Office for Global Concerns. “We stand with all people of faith who welcome these families fleeing unbearable violence and death with compassion and open arms,” Lee added.